I have been living alone now for just over two years and I like to think I have found a few loopholes, hacks, tips and tricks if you will. I thought it might be helpful to put together a little cheat sheet, this could be for other people who live alone, people who are thinking about it and even those leaving home to go to uni. So, here it is, my top tips on how to live alone. Okay so I may be speaking from experience with this one, so learn from my mistakes! If you ever lose your key, leave it on the kitchen counter or need to let someone in when you’re out, then you need to get a couple of spare keys cut. I would recommend getting another three, one for under the mat or a plant pot, another for a family member or close friend and another with a neighbour. Seems excessive but seriously, thank me later. If you ever have a power cut or just a set of temperamental electrics, you need to know where your trip switch is. If your power cuts out and you’re fumbling about with the torch on your phone make sure you check your switches, turn them all off, count to ten and then turn them all on again. Nine times out of ten thats all you need to do get back up and running. This should be shown to you when you move in but if not make sure you ask. This is actually a nugget of advice from my Dad, so if you’re reading this Dad, thanks! But in all seriousness, its a good’un. Buy a cheap box or leaver arch folder for all your important paperwork and documents such as bills, pay slips, council tax stuff and tenancy agreements. That way if and when you need them, they are all in one place and you won’t need to go rifling round your house. Okay so this might not be applicable to everyone but if you’re anything like me and are s*** scared of spiders then this is a no brainer. I can’t even go near them without my heart pounding into my lungs so I figured that prevention had to be better than a cure. Spiders hate really clean and chemically treated environments, so if you’re not keen on them, make sure you go to town on the Dettol and a duster on all the nooks and crannies to ensure it is super clean and dust-free. Once you’ve done that, get yourself a spray. I use this one from amazon and it is completely brilliant. However, if you don’t want to use too many chemicals and prefer to use a more natural approach to cleaning, they also hate essential oils such as peppermint, tea tree and lavender. If you add 7 drops of one of these to a (glass, as they can react weirdly with plastic) bottle with an inch of warm water and shake well, it should do the same job in keeping your home spider-free. Something I didn’t appreciate until I reached adulthood, was how expensive hoovers are! I currently have a super old Dyson which does a good job but it is so damn heavy that I usually have to ask someone to give me a hand with it up the stairs. I’m thinking of picking up a new one on Black Friday (wild, eh?) but if you’re moving out to your own place, I would definitely say invest in a hoover that is light and comfortable for you to use (particularly if you are in a house rather than a flat). By tool kit, I don’t mean like an electric drill or expensive power tools (but if you want to, go straight ahead!) , I mean just a few basic bits. In mine, for example, is a phillips head screwdriver, a normal screwdriver, a spirit level, a hammer, a measuring tape, and an allan key or two. Just some really basic tools that will help with putting up prints, putting together flat-pack furniture and tightening up any loose screws. Something I myself need to invest in is a little step ladder. I have these weird lights that are fixed to the wall and I can’t reach them, so when the bulb goes, I need to get a tall friend or family member to do it for me which is just annoying. Some miscellaneous bits I would also recommend include spare lightbulbs, extra batteries and extra loo roll. I can’t tell you how important it is to make your house a home, whether its rented, university halls or a room in a shared house - make it yours. Adding plants and flowers will instantly make your space feel lighter and airier; and if you are someone who isn’t great at remembering to water them, invest in some faux greenery or a couple of cacti. Mirrors are a great way of making a room appear bigger and brighter so why not add mirror on your dresser as well as a full length one to reflect the light. Get yourself some prints as this is where you can really put your stamp on a place and let your personality shine. 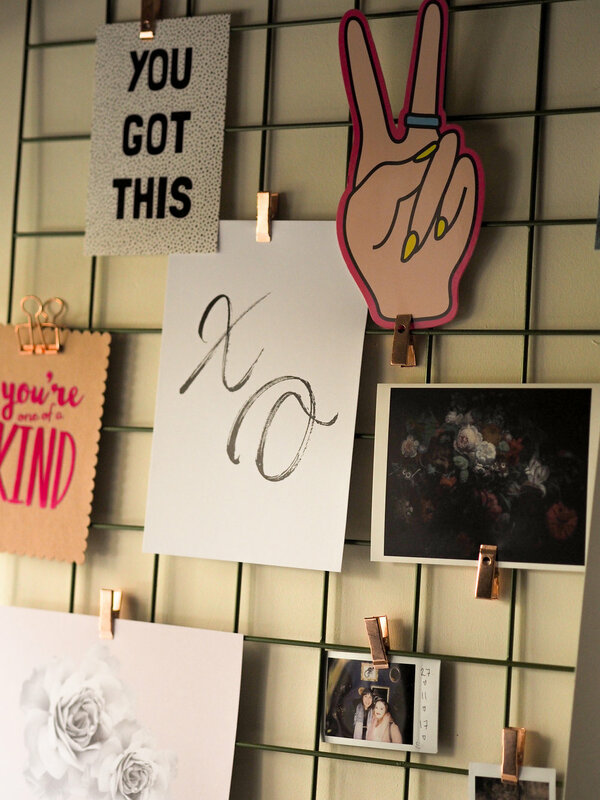 If its rented and you’re worried about holes in the wall, get some Command Picture Hanging Strips - all you do is stick them to your wall and then attach the other side to the back of your frame. It doesn’t damage the wall and is a great option if you are indecisive and don’t know where to hang what. In terms of prints, I can’t recommend Desenio highly enough (not sponsered, just brilliant). They must have hundreds if not thousands of prints and frames at really reasonable prices (think just a couple of pounds) to decorate a bedroom with, start your very own gallery wall or just to had a bit of interest to an otherwise dull hallway - Desenio has you covered. I would also suggest picking up some bedding you really love, it doesn’t have to be expensive but will work wonders at making your room feel like yours. A couple of my other favourite (affordable) homeware shops include, Dunelm, Matalan, TK Max and of course Home Sense.